2003: In 2003, Chris Pinkham and Benjamin Black presented a paper on how Amazon's own internal infrastructure should look like. They suggested to sell it as a service and prepared a business case on it. They prepared a six-page document and had a look over it to proceed with it or not. They decided to proceed with the documentation. 2004: SQS stands for "Simple Queue Service" was officially launched in 2004. A team launched this service in Cape Town, South Africa. 2006: AWS (Amazon Web Services) was officially launched. 2007: In 2007, over 180,000 developers had signed up for the AWS. 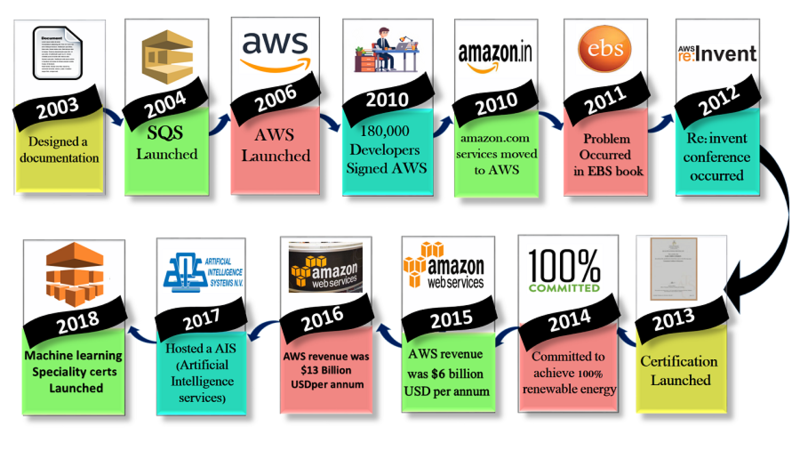 2010: In 2010, amazon.com retail web services were moved to the AWS, i.e., amazon.com is now running on AWS. 2011: AWS suffered from some major problems. Some parts of volume of EBS (Elastic Block Store) was stuck and were unable to read and write requests. It took two days for the problem to get resolved. 2012: AWS hosted a first customer event known as re:Invent conference. First re:invent conference occurred in which new products were launched. In AWS, another major problem occurred that affects many popular sites such as Pinterest, Reddit, and Foursquare. 2013: In 2013, certifications were launched. AWS started a certifications program for software engineers who had expertise in cloud computing. 2014: AWS committed to achieve 100% renewable energy usage for its global footprint. 2015: AWS breaks its revenue and reaches to $6 Billion USD per annum. The revenue was growing 90% every year. 2016: By 2016, revenue doubled and reached $13Billion USD per annum. 2017: In 2017, AWS re: invent releases a host of Artificial Intelligence Services due to which revenue of AWS doubled and reached $27 Billion USD per annum. 2018: In 2018, AWS launched a Machine Learning Speciality Certs. It heavily focussed on automating Artificial Intelligence and Machine learning.